Who Wants to Go Over The Edge? Deadline to apply is Wednesday, May 8, 2019, at 12:00 pm. IIAAustin has teamed up with Trusted Choice to sponsor the Make-A-Wish Central and South Texas Over the Edge Fundraiser! IIAAustin has 2 spots up for grabs. 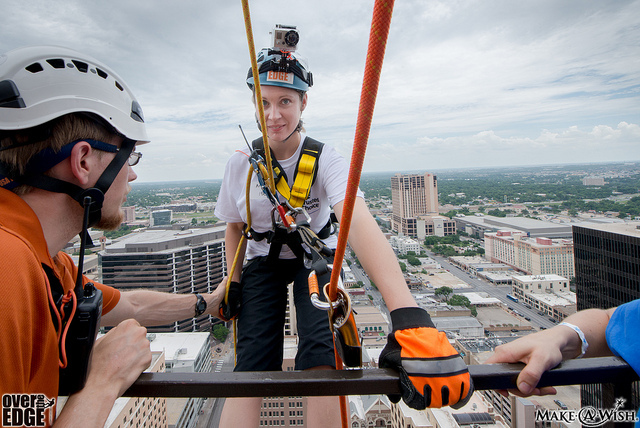 Do you have the guts to step up, go over the edge and rappel 32 stories down 600 Congress in the heart of downtown Austin? If so, email IIAAustin with your contact information and tell us to throw your name in the hat by 12:00 pm on Wednesday, May 9th. You must work for a member agency or company of IIAAustin. Contact IIAAustin if you need to confirm your membership. You must be able to rappel on Saturday, June 8, 2019, at 9:00 am as this is our assigned spot. You will need to arrive by 8:00 am to check-in. If you have previously rappelled with IIAAustin through our sponsorship of this event in past years, you do not qualify. You do not have to raise funds to participate. Our sponsorship covers your rappelling spot. Are you ready to throw your name in the hat? Hit your reply button now to enter our contest for a rappelling spot. The winner will be drawn and announced at our May 8th luncheon at Maggiano's in the Domain.